so i hope by now that you have checked out the posts by Christie on her fab Sweet Tidings blog. The ideas she posts always put me in such a crafty mood, and she is also super kind and leaves lovely comments on my blog that are super encouraging! This is one of the patterns she posted a while back that i was dying to try. I love the way he turned out (ok maybe except for the wonky eye placement...i was distracted by a particularly exciting bit in the movie i was watching...oops!) but i will definitely be making more of these in nice pastel baby-colours as ornaments for the many little baby presents that are required in my world these days! 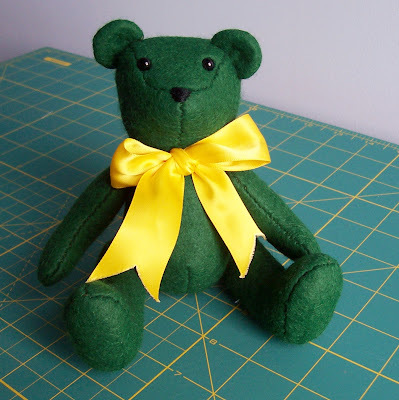 Everyone should try this one...it was a perfect "sew-while-watching-a-movie-craft"
Wow, so glad you tried the little teddy! Yours is super duper cute! I love the color! just yum spooners! loving the green - it is making me 'green with envy' that i dont have one!! what is he called? Being green he's bound to have an Irish name! He's really lovely. I couldn't find the pattern on your link but I couldn't make it anyway!